BOAT PLANS ... Delivered by DOWNLOAD to your computer within 12 hours of you placing your order. 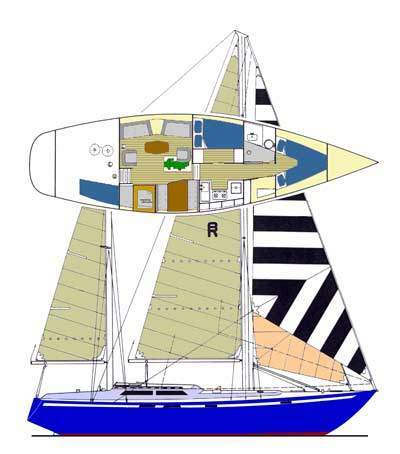 These UPDATED FIBERGLASS plans are designed to allow any person making a survey of a Roberts 44 to compare the designed construction with the actual construction of the particular Roberts 44 being surveyed. 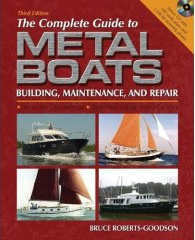 Updated sail and rigging plans are included in this package. The plans have lists of materials & equipment etc & these will be useful in SURVEYING the complete boat. 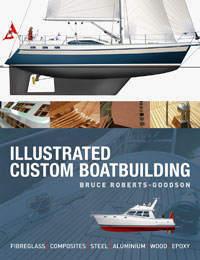 Each PLAN contains ALL the construction drawings for as applicable to this particular boat plan - with up to 25 sheets per plan! Lists of materials - Technical information - Numerous construction drawings are all included. 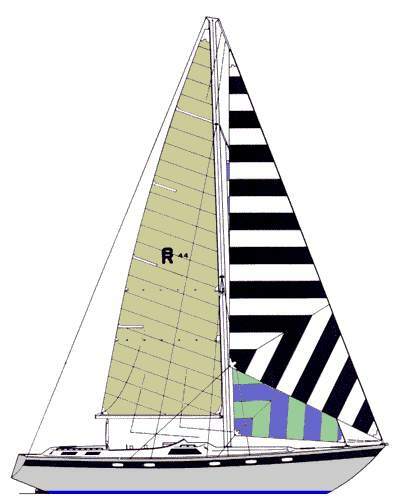 This design has appealed to many serious cruising sailors, and is a timeless example of a well found cruising yacht. Available for construction in round bilge fibreglass. 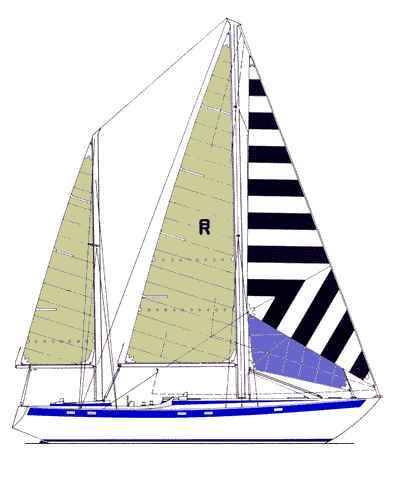 There are countless numbers of this design throughout the world and ever since we first designed her in the late seventies it has been a favourite with cruising folk. 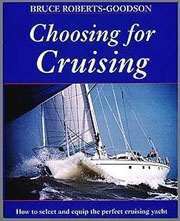 If you are in the market for boat plans for a cruising boat that is strong, safe, comfortable, good to live aboard then this design deserves your serious consideration. Good cruising designs don't date. This is one of them. 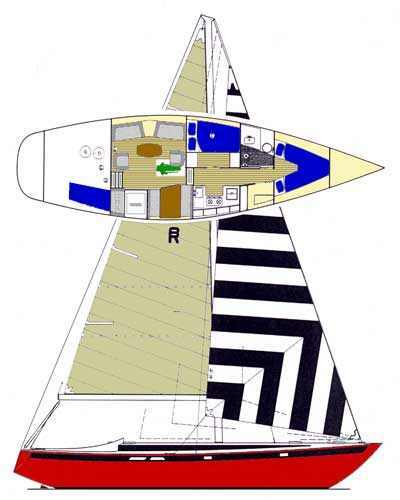 The boat can be built as either a Cutter, Sloop or Ketch rig and has a low profile aft cockpit or Centre cockpit arrangements. L.O.A. 13.62 m 44' 4"
L.W.L. 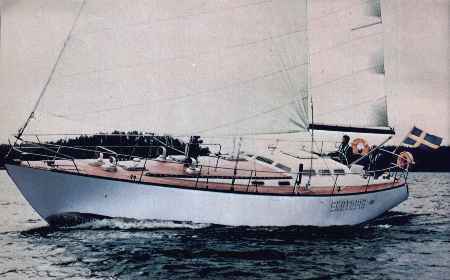 10.00 m 32' 11"
BEAM 3.89 m 12' 9"
The Roberts 44 was intended as a fast cruising yacht that could be built by an amateur. The lines reveal a relatively short waterline of 32' 10", rather full ends, longish overhangs and a gentle, sweeping sheer. The displacement to length ratio of the yacht is 339. The interior of the Roberts 44 will appeal to all of us who have thought about living aboard at one time or another. The designer has provided large open areas with careful attention to the galley and after stateroom. Roberts has also been considerate enough to provide two excellent sea berths. One is a pilot berth in the main cabin, the other a quarter berth located in the passageway. The forward head is quite large, and it seams that a separate stall shower would be rather easy to design into this arrangement. Indeed, the best way to avoid this pitfall is to deal with a designer, like Roberts, who has extensive experience in this field. He has established his credentials and gained a wide following. Some home builders projects turn out "children" that only a mother could love. 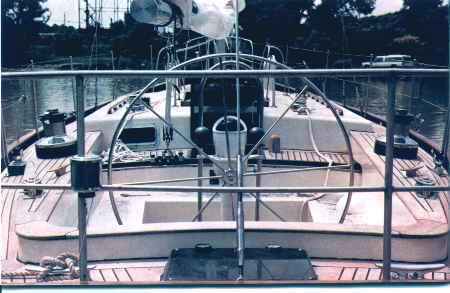 It is therefore wise to choose stock boat plans from a designer who has answered all the frequently asked questions many times. The art-science of designing yachts for amateur builders is as demanding, if not more demanding, as designing yachts for the buyer of the finest custom yacht. Bruce Roberts has my endorsement.